There is a growing recognition in churches today about the need for discipleship. In what follows I would like to describe, from the Gospel of Luke, what it means to be a disciple of Jesus Christ. Luke has some helpful insights about discipleship. The first eight chapters are focused on “who is Jesus?” But there’s a shift in chapter 9, where Peter with the help of the Holy Spirit realizes that Jesus is not one more in a succession of prophets and teachers. Peter says, “You are the Christ of God” – you are the Messiah, the one who is bringing the ruling power of God back into the world to heal and repair all the brokenness—whether it’s spiritual, psychological, social, or physical. The second and more cryptic line is, “Let the dead bury their own dead.” Obviously physically dead people can’t dig graves, so the first noun must refer to the spiritually dead. To be spiritually dead means to be as blind and insensitive to spiritual reality as a physical body is to physical reality. You may be saying, “Well, I believe in Jesus, but I can’t put him first right now. I’ve got my career; I’ve got to wait till my parents die, because they would be unhappy if I became a Christian . . . I see who he is and what he’s done, but I’m not going to put him first just yet. Someday I will.” When someone says, “I understand Christianity. I’m just not ready to put it at the central place in my life,” then that person really doesn’t understand it yet! Jesus says: Putting anything before me reveals spiritual deadness. Let the dead bury their dead. If you put your father before me, there’s a spiritual deadness in your life. This would be the kind of prophet the world can relate to. But Jesus Christ doesn’t rebuke the unbelieving Samaritans; he rebukes the disciples! He is the absolute un-Elijah. Can you imagine their continued perplexity if they still believe he’s greater than Elijah? The soldiers come after Jesus to kill him—in the Garden—and what does he do? He heals an ear that was cut during a skirmish. Later on, the soldiers are pounding nails into his hands, and what does he say? Father, forgive them; they really don’t understand what they’re doing. Look back over the years, and you will see that when people want to atone for their sins and be forgiven, they put a sacrifice on the altar and burn it with fire. There’s something inside us that intuitively says, “That can’t be enough to put away sins.” That’s right. All those fires were pointing to this fire. It didn’t come down on the Samaritans or the soldiers, because it came down on Jesus Christ. He came to take it. He came to bear it. Luke 9:22 says, “The Son of Man must suffer many things and be rejected . . . and on the third day be raised to life.” They rejected him; shouldn’t they be rejected? He’s rejected for them. The Son of Man came to be rejected and to be killed. This is the secret to the change of identity. You have to be melted and amazed and astounded that he took the fire, the punishment, for you. And that’s the key to everything else. Here’s the reason: You cannot change your identity without a radical experience of mercy; without a radical experience of grace; without a radical experience of love. I’ve heard people say, “You’re right. I probably should change my identity, build my identity on God.” But you can’t change your identity by just deciding. It’s not an act of the will. A person can’t just say, “You know, I’m having a problem in my life because I built my identity on my parents’ expectations. I think I’ll build my identity on my career and accomplishments.” You can’t do that! That’s not transformation; that’s acting. Your heart is not a computer in which you can just install a program. There’s only one way that the root of your personality can be changed, and that is by an experience of love. Only when your heart experiences love from a new source beyond anything it’s ever known before will your heart start to move toward that source, and begin to be deeply changed. So you have to have all three. There must be an experience of this new, radical mercy, which leads you to find a new identity, which in turn helps you set a new priority. Notice three practical things about being a disciple. First, discipleship is not an option. Jesus says that if anyone would come after me, he must follow me. If you want to come after me—it’s a general term—if you want to have any experience of me, any relationship with me, you have to be a disciple. There are not two kinds of Christians: regular Christians and people who are really disciples. There’s only one: to be a Christian is to be a disciple. To have anything to do with me is to follow me in the way I define it: setting a new priority, finding a new identity, experiencing living out of a new mercy. Second, having said that it’s not an option—on the other hand, it is a journey. It’s rhetorically brilliant of Luke to note this. In verse 51 Jesus sets out on a journey toward Jerusalem. It’s Jesus’ journey of discipleship, “He sets his face to go to Jerusalem.” And it’s from the moment he begins his journey toward the cross that he begins all his teaching about discipleship. All the next nine chapters, all the teaching on discipleship, comes as he’s going on a journey. This is Luke’s way of saying that discipleship is a journey. In other words, on the one hand, there is a decisive point. You have to leave. Have you left? To go on the journey means saying, “I take my hands off my life.” To go on the journey means saying, “I give up my right to self-determination.” To go on the journey means saying, “I will obey you, Lord, and I’ll get rid of all the if’s. Not “I’ll obey you if,” but obey. Period. “I drop my conditions. I drop the if’s; they’re gone!” Not until you say that have you begun the journey. However, after your decisive beginning, the fact remains that it’s a journey. It’s a process that takes time. You’re not going to have it all together. It’s very important to keep that in mind, because if you think that discipleship is the way you’re saved—that by being committed and focused and giving Jesus the priority you’re going to please God and that will get you saved—you’re missing the point. Look at the order. He doesn’t say, “If you follow me, I’ll go to the cross for you.” He says, “I’m going to the cross for you, so follow me.” You’re not saved because you’re a disciple; you’re a disciple if and only if you understand what he has done to save you. There is one last thing. The sign of true, growing, gospel disciples is their gentleness. What really amazes me about the heart of this passage is that the disciples say, “We’re going to show you how intensely committed we are to you. Look at those people rejecting you. Don’t you want us to bring fire down on them? !” And what does Jesus say? “You don’t get it.” And here’s why. My experience is that committed disciples of any religion, philosophy, or political cause are hard on themselves and on other people too. They’re committed to the cause, so why aren’t you committed to the cause? You should all be committed to the cause; what’s the matter with you? But the gospel is utterly different. The harder you are on yourself and the gospel, the easier you are on other people. Jesus Christ is saying: My disciples are not terrorists. My disciples know they’re saved by grace, so when they look at people who aren’t doing it right, they don’t say, “Why aren’t you as good as we are? Why aren’t you as committed as we are?” They don’t call fire down from heaven. Jesus says to his disciples: You don’t understand yet. You haven’t had the transformation of identity, because you don’t yet understand my mercy. You don’t know what I’ve done for you, because as yet you can’t, but someday you will. These disciples are probably racist; notice this: they’re calling down fire on the half-breed Samaritans. A lot of Israelites have done a lot of things to reject Jesus, but this is the first time any of his followers wanted fire to come down. Perhaps there’s racism; there’s definitely self-righteousness. Superiority, bigotry, stridency, harshness—they go away, the more you become a disciple. They go away as you become aware that Jesus took the fire for you, as it becomes more central in your heart. And that’s a sign that you’re not just trying to save yourself, not just being religious. Are you becoming more gentle? More tolerant? More gracious with people around you? More kind? Follow Jesus. He’ll give you what you need. He’s a wonderful counselor. One guy comes and says, “I’m ready to follow you wherever you go.” Jesus says, “Go home and think about it.” Another guy says, “I want to go home and think about it.” Jesus says, “Follow me.” Why? Because he’s the perfect counselor. All other counseling theories look flat next to his, because he never gives you a template. He gives you exactly what you need. Follow him, and he will love you singularly. He will love the real you, and love you into a whole new identity. He will give you exactly what you need. 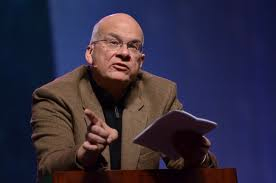 Sermon by Dr. Tim Keller given February 9, 2003, at Redeemer Presbyterian Church, New York. Edited and transcribed by the C.S. Lewis Institute. About the Preacher: DR. TIMOTHY KELLER was born and raised in Pennsylvania, and educated at Bucknell University, Gordon-Conwell Theological Seminary, and Westminster Theological Seminary. He was first a pastor in Hopewell, Virginia. In 1989 he started Redeemer Presbyterian Church in Manhattan with his wife, Kathy, and their three sons. Today, Redeemer has more than five thousand regular attendees at five services, a host of daughter churches, and is planting churches in large cities throughout the world. He is the author of King’s Cross (on the Gospel of Mark), Counterfeit God’s, The Prodigal God (on Luke 15), the New York Times bestseller The Reason for God & the forthcoming Center Church (August 2012).